With fierce competition in the entertainment landscape—both in the home and from venues down the street—facilities now see adding “fringe” attractions as a way to help differentiate themselves, generate buzz, and create unique, share-worthy moments for their guests. What do we mean by “fringe”? These are out-of-the-box ideas that go beyond what customers might expect to see on a typical trip to a theme park, zoo, or family entertainment center. By offering alternative types of attractions, facilities have the capability to test the bounds of the market—and give people a memorable experience in the process. “By learning a new skill or pushing stamina and drive with a new activity, people test self-belief and physical and mental agility,” says Kieran Lancini, public relations director for midway new openings and new brands at Merlin Entertainments, whose Bear Grylls Adventure opens this fall. Guests here will have the opportunity to explore a whole collection of climbing, diving, and high-ropes activities, perhaps ushering in a new breed of thrill parks (more on this later). However, fringe entertainment doesn’t necessarily require racing blood pressure to be successful. Other facilities have found attractions, such as ax throwing and curling, can fill a niche for guests who crave novel forms of fun. 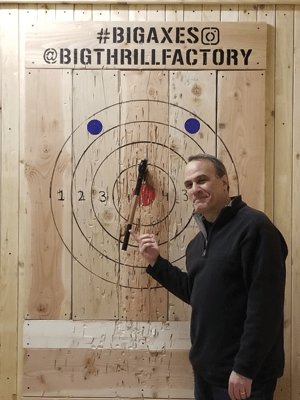 Big Thrill Factory opened Big Axes Hurling Hall in February, giving visitors the chance to throw axes at wooden targets in a game of skill. Big Thrill Factory in Oakdale, Minnesota, featured an escape room as a core attraction, but with limited hours and throughput, owner Barry Zelickson felt the space could be put to better use. People toss real axes at wooden targets to earn a high score in this game of skill. While rapidly growing in popularity as a stand-alone attraction, it hasn’t quite cracked the family entertainment center (FEC) market until now. Big Thrill Factory’s Big Axes Hurling Hall opened in February in a cozy lumberjack-style lodge. Along with being relatively inexpensive to build, ax throwing checked off several important boxes for Zelickson. The unique, challenging attraction practically begs people to come back and try it again (unlike an escape room), he says. It’s fun to watch, so that also encourages more guests to play and share their experiences on social media. Customers can order food, beer, wine, and other beverages while participating, which increases per-cap spending. Ax throwing can’t be re-created in a home environment—or probably shouldn’t be, at least. And it attracts a wide audience, from Scouts earning badges, to friends out for a Saturday night, to corporate team-building events. Open to guests ages 11 and older, sessions can be booked for 30-, 60-, or 120-minute blocks, with game winners earning free coupons for other attractions at the FEC. Zelickson knows some fellow operators may balk at the idea of tossing a potential weapon, but he says that safety—as with all his attractions—comes first. Guests watch an instructional video before starting, and a trained “axpert” guides them along the way and helps keep score. Fencing separates the two lanes, and only the person throwing can access the ax. Encouraged by the early numbers, Zelickson already added a couple new twists to the attraction. A professional knife-juggling act comes in for VIP events to teach guests how to throw machetes, and he started a “carnival-style” promotion where visitors buy eight ax attempts for $4, with a bull’s-eye earning a small prize. So far, Zelickson hasn’t fielded any guest complaints regarding this unconventional attraction—and with all the excitement generated, he doesn’t anticipate much negativity coming. “It never hurts to add something that will get people to talk about you and bring them back to your facility,” he says.